As hunting has slowed to a complete stop as of the past few months, I feel it best this series come to a close and take a graceful and final bow. Thrift stores and flea markets are drying up, and if they do have something I want its usually priced too high to be a considered a score. So this series will end with a handful of pickups that I’ve found, but I never got around to posting. As most of these are outlet store finds I can’t price them all, because everything is purchased by weight, making giving them individual prices too much math for me. But there is one small lot of items that I do know the exact price of because I bought it specifically just so I know what I paid for it. This is a bit of a mixed bag, quite literally. I picked up a bag of christmas lights for a project and while looking through it I spotted this bag of 32x information. 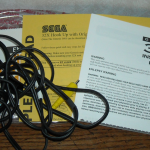 It had various cables and stuff for the 32x, but for some reason I never checked the bottom of the bag to see if there was a 32x inside! Its been too long to start worrying about it now, but if I happen to find one I’ll have the information and cables to use it. 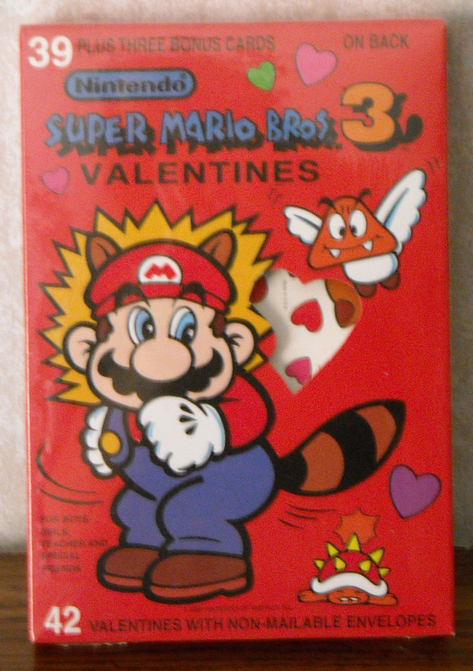 I remember actually receiving some of these when I was a child, but back then I didn’t own an NES nor did I have the collectors mind that I do now. 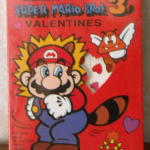 The outlet store had a tub filled with vintage valentine’s cards of all kinds, but the only pack I was interested in was this one, which are still factory sealed! Had there been more I would have gotten as many as I could, but sadly this was the only one they had. Regardless its a pretty cool little collector’s item from the glory days of Nintendo and their keen promotional tactics. You simply never know what you may run across when you’re peering into the seemingly bottomless blue bins at the outlet store. Often its just filled with endless junk nobody else wanted, and sometimes treasures nobody else wanted. 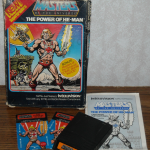 The box pretty much tells the tale as it was crushed under junk, while the cartridge was in another bin and the manual and overlays were in yet another. 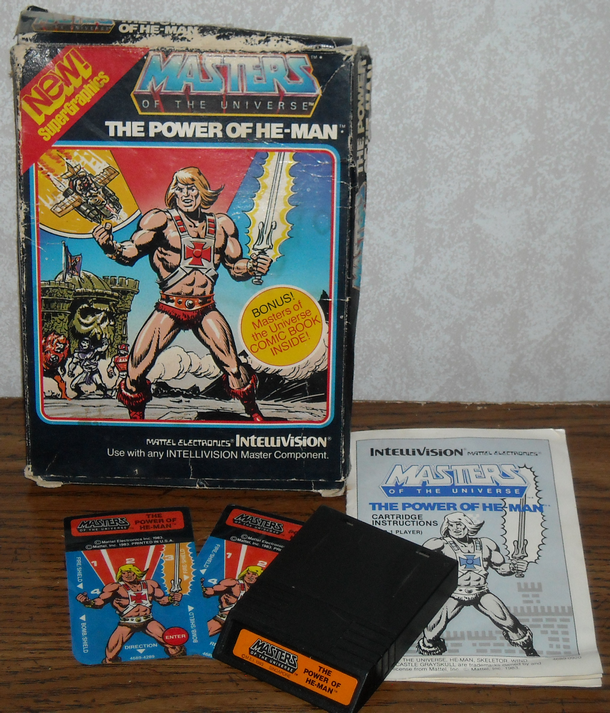 After putting it all together I was pretty excited, even though I don’t even have an Intellivision. Playstation controllers, especially the dual shock, are a penny a pound, but there were a few uncommon controllers I was actively seeking. 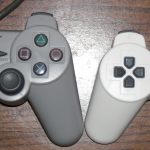 First up is just the standard white controller, no analog, no vibration, just normal controller functions in a strange color, since they didn’t release a Playstation in white until the PSOne. Secondly is a controller I’ve ran across before, but didn’t want to pay the insane price for, and that is the Dual Analog. The Dual Analog has no vibration feature, but offers 2 different analog settings, concave thumbsticks and also sports handles that are longer than any other PS controller. 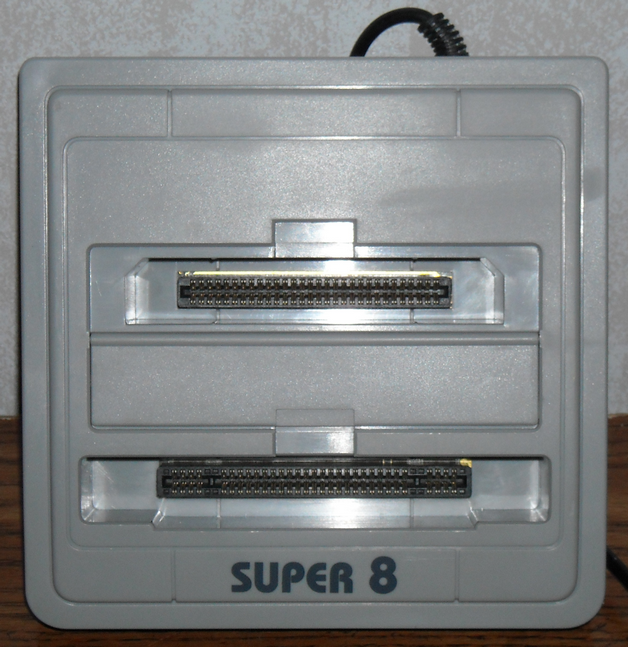 From what I understand the Dual Analong was a failure and now is considered to be rare, but when it comes to anything vintage gaming, isn’t it all nowadays? 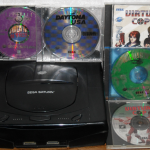 At the beginning of the year I potentially risked my life to go pick up a Sega Saturn model 2, which turned out pretty well. I had Guardian Heroes but I also went to Disc Replay and picked up FIFA, but for the longest time I couldn’t find anything in thrift stores. Later I happened to find Ultimate Mortal Kombat 3 and a broken copy of Daytona USA hidden inside a Playstation case at a Goodwill store. 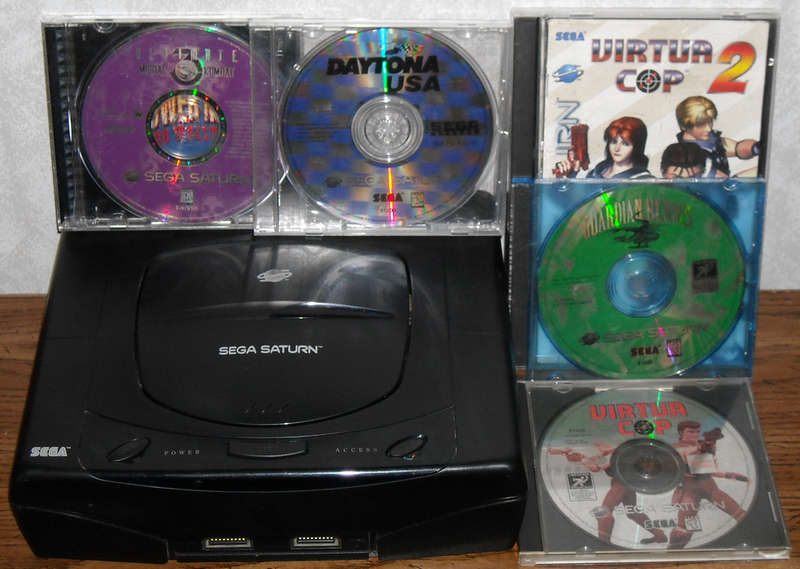 Later the outlet store gave me Virtua Cop 1 and 2 as well as a working copy of Daytona USA. But the biggest find was when I found a dusty old Saturn model 1 sitting in a bin, it needed cleaned and the laser adjusted but it was worth the outlet store price! I am enthralled by pirated and just downright strange attachments, controllers or anything that has to do with video gaming really, and the Super 8 delivers that four times over! When I found this at the outlet store I thought it was something else, but I was still pretty damn excited to have found it. 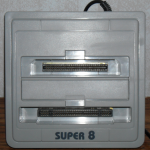 I’m not sure video game peripherals get any more weird than the Super 8. 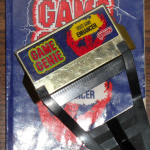 This one is a bit of a tricky situation, the book came from the outlet store and cost me 25 cents while the Game Genie actually came from a local thrift store called The Recycle Bin for 99 cents. For about $1.50 (tax included) I have to say this is a pretty decent grab! 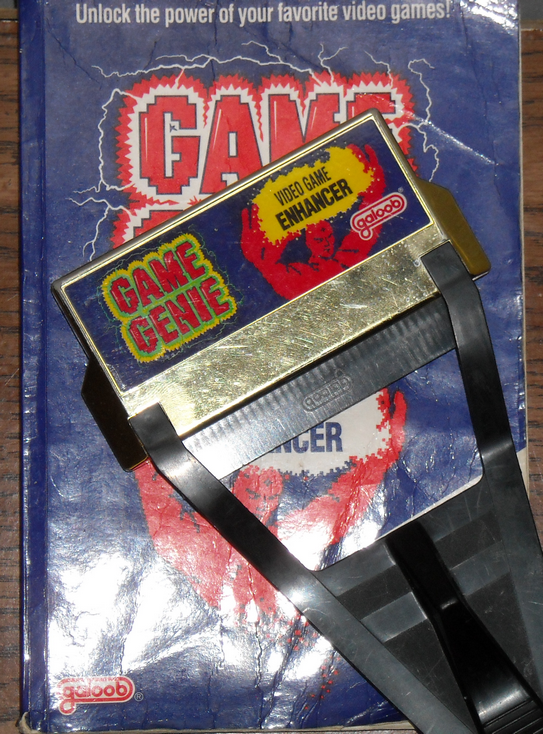 I already own a Game Genie and book, but they’ve been packed away in a box for years. Could you pass up these for that price for the sheer luxury of not having to dig through boxes to find your other one? Yes, you read that correctly. I found an NES top loader at the Goodwill outlet store, where almost everything is sold by weight instead of some ludicrous price the managers found online. I had always hoped I would run across one at the outlet store, yet I never honestly thought I would, and if I did it would be in the possession of someone else. 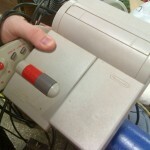 I was doing my normal digging when I ran across an NES dog bone controller (the third one I’ve found there), then I noticed a normal rectangle controller as well as an NES RF adapter all in the same bin. Now, for some reason all of the cables get tangled together, causing you to slow down and untangle whichever item you want (controller, AV/RF cables, power supply, etc. ), but also when you pull on any given item you have the resistance of the whole ball of wires pulling against you. As I pulled on the dog bone controller I felt that resistance, so I wasn’t thinking there was anything on the end, apart from a huge mass of phone cables, misc. power cords, coax cable, etc. I slowly snatched up the rectangle controller and the RF adapter and went back to pulling on the dog bone controller. The more I pulled the less resistance I received, so I assumed this rat’s nest wasn’t too large, but as I kept pulling out popped a small, dark grey bit of plastic with a shiny silver sticker on the bottom that said NES Control Deck NES-101. It couldn’t be! 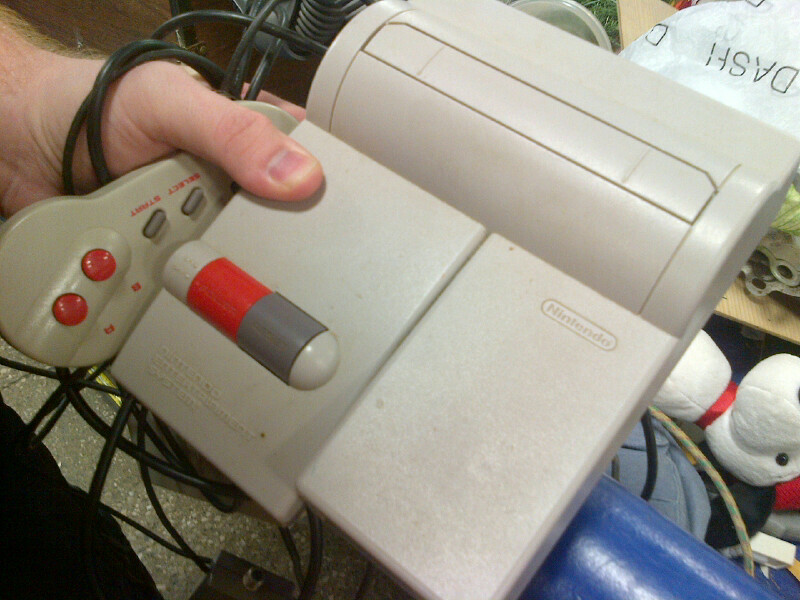 It was smaller than a normal NES, but this just simply couldn’t be my luck, an NES top loader from the outlet store? Surely not! I must have done something right, because it was. Jumping around like a ninny and stopping only long enough to snap a pic of it in front of the bin I had just resurrected it from, I made sure that all I was going to purchase was the control deck, both controllers and the RF adapter. I rushed to the counter with a massive grin on my face, failing miserably to hide it, and paid what the cashier asked. Once outside I snapped a pic of the receipt, because nobody would otherwise believe what I paid.